Toyohara Chikanobu (1838 - 1912) Actors as Goldfish and Turtles, 1886. Oban Triptych. This print by Chikanobu is very rare. We cannot find a record of its existence and it is both uncharacteristic of Chikanobu’s style of the period and of his subject matter. 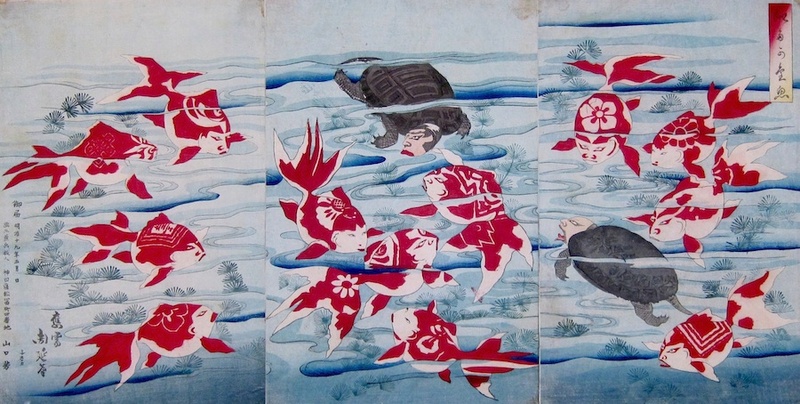 The print portrays actors of the kabuki stage disguised as goldfish and turtles. Kuniyoshi (of whom Chikanobu was a pupil) first made fan prints of this subject in 1843 and again in 1848 in an elaborate triptych of turtles. Yoshiiku did a similar oban print to this in 1863. The depiction of actors, their names or their crests was banned in Japan during the period of the Tempo reforms in the 1840’s. Ukiyo artists, notably Kuniyoshi, found ways around the prohibition by putting actors in historical scenes or by disguising them, as in this case, as animals. The reforms had long been overturned by 1886, and one can only imagine that this print was an homage to Chikanobu’s teacher and the genre was briefly revived for entertainment alone. It is a fine and hugely entertaining piece. Twelve goldfish and two turtles swim around in weed. Each creature carries a distinctive pattern on its back. It transpires that these are the actor crests or mon of individual kabuki players or their families. Part of the entertainment of this print would have been identifying the actor by their portrait, their crest or both. 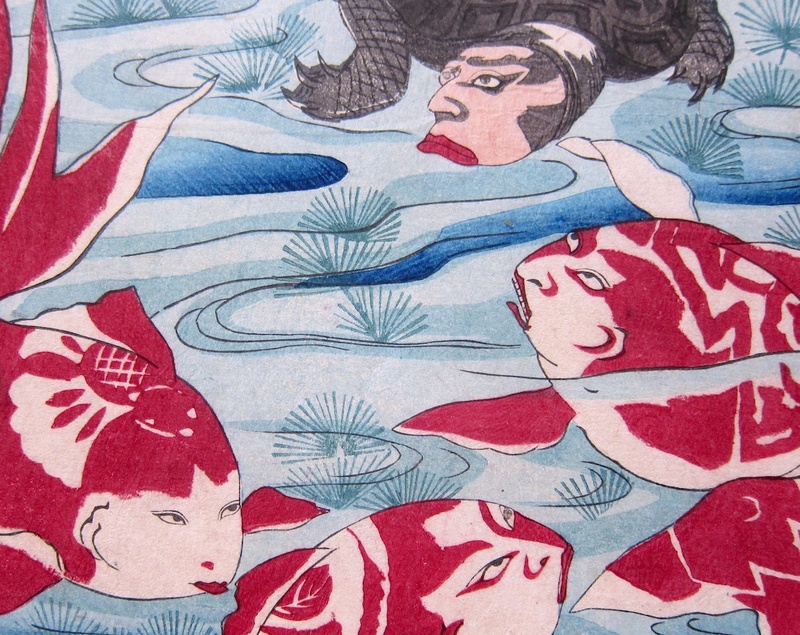 For example, the distinctive rice measure mon of the Ichikawa clan is visible on the fish at bottom right. This is a unique print from an important artist. The colour and impression are good, with embossing in the fish scales and fins. Condition is good with some minor tape stains to the top corners. Overall, very good. Full size and unbacked. Signed oju Chikanobu hitsu, published by Yamaguchi Yoshi.